SOUND OF SPRING (detail) © Jiafeng Xin, a Chinese artist, a member of the Beijing artist association and the oil painting association of China. A painting reproduction is copied from The Chinese Book of Paintings (2005). The Cashmere Goat ( Capra hircus Laniger) is a mammal belonging to the subfamily Caprinae of the family Bovidae. The goats produce a double fleece consisting of the fine, soft undercoat or underdown of hair commingled with a straighter and much coarser outer coating of hair called guard hair. In order for the fine underwool to be classified and used as cashmere it must be de-haired. De-hairing is a mechanical process that separates the coarse hairs from the fine hair. 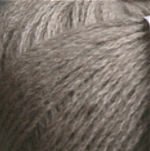 After de-hairing, the resulting "cashmere" is ready to be dyed and converted into yarn, fabrics, or garments. The Cashmere goats reside predominantly in the high plateaus of Asia with the most significant populations being found in the northwestern provinces of China, Mongolia, Iran and Afghanistan. 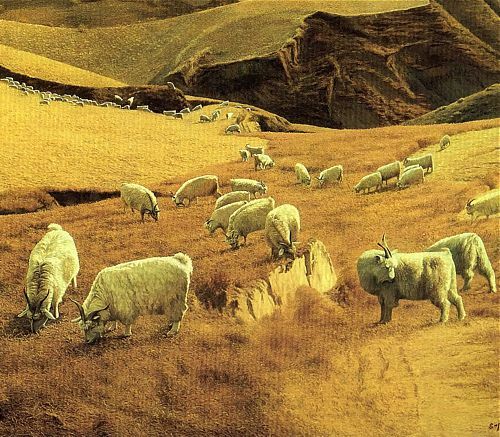 The best quality cashmere is made of the undercoat of cashmere goats, which live with harsh winds and poor vegetation in the barren Asian steppes. The more extreme the conditions, the better the quality of cashmere. Many nations in that area rely on cashmere as a luxury product that is exportable for high profit, including the significant supplier countries: China and Mongolia. China is the largest producer of raw cashmere. Current estimates of production put China's annual clip at approximately 10,000 metric tons. Mongolia produces somewhat more than 3,000 tons annually with Iran, Afghanistan, Turkey, Pakistan, India and Central Asian Republics producing significant, but lesser, amounts. 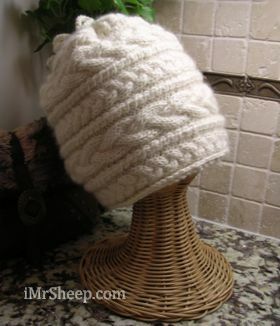 Cashmere ( Kashmir) is characterized as a luxuriously soft wool with high loft. It is extremely warm (in order to serve its original purpose of protecting goats from cold mountain temperatures). Cashmere Fibers are highly adaptable and are easily constructed into fine or thick yarns, and light to heavy-weight fabrics. Natural colors: Grey, Brown, and White. Pure cashmere can be spun into yarns and knit into sweaters, hats, gloves, socks and other apparel items, or woven into fabrics and then cut and assembled into garments such as outer coats, jackets, pants, scarves, blankets and other highly luxurious and desirable items. Fabric and garment producers in Italy, Scotland, England and Japan have long been known as market leaders in cashmere, although recent trends have seen a growing production from countries that actually produce the fiber, like China and Mongolia. Self-cleaning cashmere? Filatura e Tessitura di Tollegno produces approx. 4 000 000 kg Nanocashmere™ per year and exports its products to the United States, Japan, Europe and China. The company owns the brands Tollegno 1900 (pure merino and fine yarns), Lana Gatto (knitting yarns), Ragno (men and women's underwear, outerwear and swimwear) and Julipet (men's underwear, loungewear and beachwear).  Please note that some of commercial cashmere, which is used in mass fashion/knitwear production, is made of 100% nylon or acrylic Cashmilon - super soft, synthetic cashmere substitutes. Usually, those "cashmere" articles should be sold at cheaper prices.  Natural Cashmere practically has No pilling after many washes and many years of use - the clothing made of Natural Cashmere is long-lasting! Just a small amount of pilling can be visible where sleeves touch the sides of a garment. Natural cashmere is similar to Natural Mohair - it is strong enough to be worn for a life time. How to differentiate between Natural Cashmere and substitutes: Knit a small swatch. Wash it gently in lukewarm water (hand wash). If there will be lots of fiber sheddings - you have a synthetic substitute.